Today, there are more smartphone manufacturers than ever before. Whether we're talking about established, decades-old companies like LG, HTC, Samsung, Apple, and Sony, or upstarts from China and India or elsewhere, it's fair to say that we have an unprecedented freedom of choice. There's almost certainly a manufacturer that caters to just what you need. And yet, pretty much without exception, all of these makers make little to no money from their operations. A recent report by Fortune, based on data by Canaccord Genuity, shows that Apple grabbed an incredible 91% of profits within the smartphone industry, with Samsung a distant second with 14%. Combined, that's 105% of the profits split between just two of hundred companies (105% because the rest had losses). That's a pretty disconcerting fact, and one that we've been well aware of for years now. Essentially, nobody but Samsung makes any real cash in Android land, and even Samsung makes almost nothing compared to Apple. 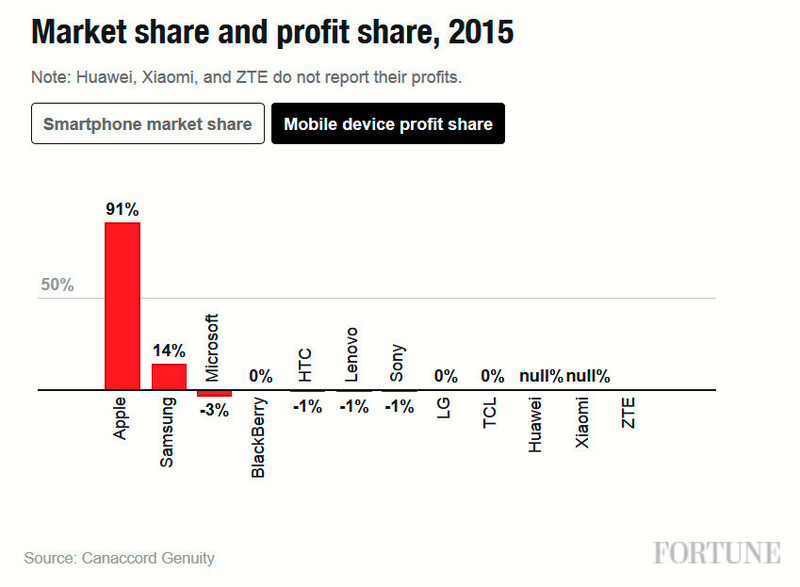 As can be seen from the chart at the top, everyone else is either barely breaking even, or losing money from its smartphone division. Inevitably, if nothing changes, it's likely that, at some point in the future, these companies may decide that exiting the market is the sensible choice—specifically since most of these companies are publicly-traded. At some point, they might have to appease shareholders by ditching the arm. With that in mind, the question we've been pondering internally is whether there's really enough room for a third major player at this point? Looking at the hard data, it seems to us that any one of these can only catapult itself into profitability land with a breakthrough product, or at least a smartphone that is objectively better than competing products from the same cycle. But without a healthy balance sheet, that sounds unlikely. What do you think? Chances are there wouldn't be any major changes until someone other than Apple reinvents the smartphone form factor. So weird..... I was thinking about this topic (the article) on my way to work today before the article was written.. Anyway.. Is it possible if we can look at the car industry and how it grew? It will have to be more than smartphone..
LG has exposed Apple and Samsung for being thieves that treat their customers like idiots. I will be buying my first non-Samsung phone from LG for the G5's removable battery, microSD, and metal construction. Look at this cool story from GSMarena:http://www.gsmarena.com/a_blast_from_the_past_mwc_10_years_ago-news-16619.php MWC from ten ten years ago, when Nokia and Sony were the biggest players, and Samsug had no idea what to do. Times have changed, and probably will change. Sony obvious... People are still sleeping on it! Only if they change their stupid management. No sony will never be best again..changing management won't help.. Usa ppl bates sony now.. I'm not sure the "people" are to blame for Sony's sagging sales. They just released the Sony Xperia Z5 line in the US - LAST WEEK. In the process they removed the fingerprint scanner because, umm, well, because. To help the sales, it's not available on Verizon (the US's largest carrier). In September their CEO said they'd rethink the mobile market if the mobile division didn't turn a profit in 2016, basically daring everybody to buy a phone that might lose support next year. Every review I've seen loves the Z5 line but if I didn't know better, I'd think Sony was intentionally tanking the mobile market. Another article that will require popcorn. Nokia? But only if it is still run by the Finnish. If samsung puts tizen on those phones, they become the third player in this phone game. Remember Egyptian God, The Ramses III??? Remember Hitler??? Remember Joseph Stalin??? Remember Soviet Union??? Remember The Great Britain??? Remember Nazi Germany??? Remember The Great Mughal Empire??? Remember BSA Motorcycles (I'm sure most of you don't!)... PRIDE COMES BEFORE THE FALL... Yesterday, Nokia was the Kingpin of Cell Phones. Today, Apple is where Nokia used to be... Tomorrow...??? Well, I'm not a fortune teller! Yes, and I'd love there to be a great 3rd option. The thing is, it would take an absolute juggernaut of a company, with a ton of established mobile relationships, and the ability to throw a ton of money at it and work at a staggering loss for years. It would take an unwavering commitment to the product, without any of the terrible shifts that a company like Microsoft did. I don't think so. It just takes an established company to make a no-compromises smartphone that is cutting edge in every way, premium, and is marketed well. Price it right (Not too expensive and not too cheap), and differentiate it in design and functionality. It will have to be Android, and it needs to have a clear-cut and fast upgrade policy in writing, along with regular security updates. Microsoft has the potential but they're going to have to invest heavily. And fast. They're always too late in the party. They've been investing heavily in the mobile market for what.. 15 years now? I seriously doubt it's going to happen at this point. They haven't really been invested, in the time that there has been Android and iOS, Microsoft has rebooted their mobile platform 3(?) times, meaning lost or changed features and app makers have to start all over with new apps. So while they've worked hard on various platforms, they haven't given one platform a chance. Hopefully Windows 10 will be the one that gets time to mature. I only see the mobile industry moving forward when apps become OS independent. When they are like HTML and run anywhere. I know that has been unsuccessful so far, but I don't really see it working any other way. Like wireless charging, Bluray, HDMI, USB, VP9, Self driving cars, etc etc, we need to have standards, and ideally open standards, in order to progress. Some of these are private license and cost money which has always meant that they eventually fail, and while they are used industry wide they seem to prevent rapid progress. That's my opinion. I perceive Android as a success because Cyanogen and Amazon can build on it and make something that works in parallel, growing the overall user base while offering custom experiences. I doubt Apple will ever be dominant until they open source. Not only is it possible, it's desperately needed. We need third options in hardware and software. Fourth and fifth options would be welcome, too. We desperately need more Apple's in the market. Android has essentially destroyed the market. Android has built the market, and pushed Apple to try and keep up. The last thing we need is more Apple's, companies that steal ideas and stifle competition. Nothing lasts forever, Even cold november rain. You just wait and see for next 5 years. soon people will get bored of Apple and Samsung phones and will switch to another premium phone make and if till then Nokia starts making good phones then it can be Nokia sharing the third spot. Just waiting for that time when people will buy Nokia phones rather than a Lumia. Third OS, no, but third manufacturer yes.